- The French launch a counterattack against the line north of Massiges seized by the Germans yesterday. Advancing at 440a, though the French are able to enter the German trenches, they are ultimately repelled in fierce hand-to-hand combat, with heavy losses on both sides. - After several months of training in the miserable conditions of Salisbury Plain, 1st Canadian Division is preparing to depart for France. Signalling the imminence of their departure, the soldiers are inspected today by King George V.
- Admiral Pohl, the current Chief of the Naval Staff, is appointed today as Admiral Ingenohl's replacement as commander of the High Seas Fleet, while Vice-Admiral Gustav Bachmann becomes the new Chief of the Naval Staff. Just as his predecessor, he is bound by the Kaiser's limitations on the deployment of the fleet; indeed, in the aftermath of the Battle of Dogger Bank Wilhelm II has forbidden even Hipper's battlecruisers from putting to sea. Pohl does, however, make use of the Kaiser's presence at the change of command ceremony to advance another goal. Standing together in a launch as it moves among the dreadnoughts, Pohl hands the Kaiser an order for unrestricted submarine warfare to be signed. Caught up in the moment and with his attention on his beloved warships, Wilhelm II signs his name without contemplating the significance of his action. Pohl for his part has gotten what he desired - authorization for the commencement of unrestricted submarine warfare against Britain. - In Galicia, after a heavy artillery bombardment the Russians break into the town of Mezölaborcz, which sits on one of the few railways in the Carpathians and thus is vital for Austro-Hungarian supply. Despite this, Conrad is more concerned with issues of jurisdiction, insisting that Südarmee communicate through the Austro-Hungarian high command instead of going directly to OHL. - As preparations continue to launch the naval attack on the Dardanelles, Britain and France are optimistic that Greece, emboldened by the Entente offensive, will join the war on their side. Today the French government authorizes the dispatch of a division to northern Greece, to encourage not only the Greeks but also the Romanians to join the war by demonstrating their willingness to fight in the Balkans. - East of the Suez Canal the commander of the Ottoman expedition to seize the Suez Canal concludes that, with the failure of yesterday's attack and no longer having the element of surprise, any further efforts would risk the annihilation of his force. Thus in the early hours of the morning the Ottomans begin to retreat eastwards across the Sinai Peninsula towards Palestine. The British forces on the west bank of the Canal decide not to pursue the retreating enemy. First, they are initially concerned that the Ottomans may renew the attack. Second, the sandstorm that had postponed the Ottoman attack from the 2nd to the 3rd had also grounded British aircraft, leaving them without aerial reconnaissance of the enemy columns. Finally, the British formations were not prepared to enter the desert - none had the water for such an attempt. As a result, the British permit the Ottomans to retire unmolested. 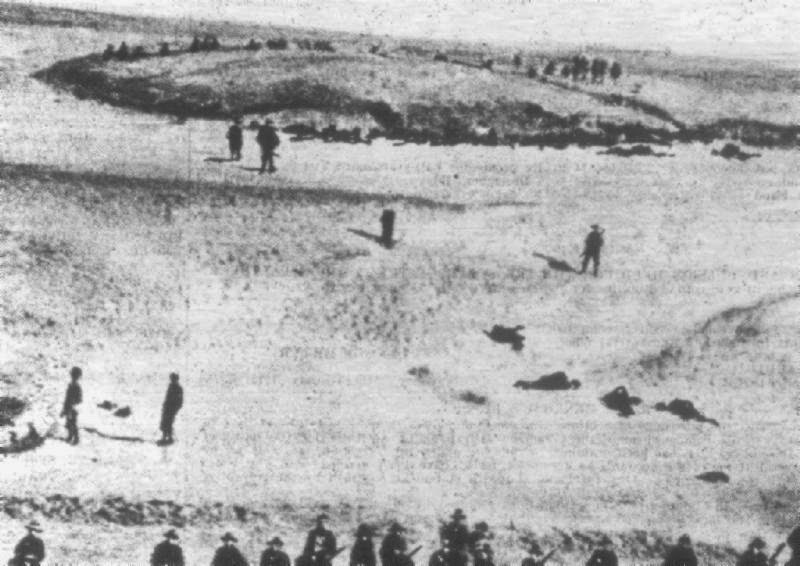 Burial parties tending to the Ottoman dead on the east bank of the Suez Canal.